Bengaluru, Karnataka, September 4, 2014 –The day began with the auspicious ceremony of lighting the lamp by the esteemed dignitaries. 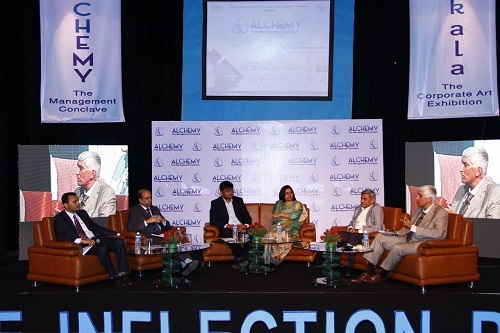 The ceremony symbolized the flagging off of Alchemy, The Management Conclave and Satkala, The Art Exhibition. This was followed by a panel discussion on “Behavioral Economies Coming of Age”. The distinguished panelists were Mr. Rajeev Mishra, Head Digital Practice, Wipro, Mr. Ravi Gowda, CEO, Global Mergers and Mr. Apurv Nagpal, ex-CEO, Saregama (HMV) and Dr. BiranchiSwar, Faculty, SIBM Bengaluru, who was the moderator for the panel discussion. The discussion sparked off by describing about the various micro and macro factors leading to the change in consumer behavior with a key emphasis on modern marketing. The learning gathered from this discussion showed how to maximize digital brand presence and align goals of the business with that of the consumer. This was followed by another panel discussion based on the theme ‘Supply Chain: Surge and Sustain’. The eminent industry expert serving on the panel were Mr. PawanBhageria, Senior Vice President,Manufacturing and IT, TATA Technologies, Mr. M. BalakrishnanGaneshan, Senior Finance Manager, Amazon, Mr.PadmanabhanBabu, Director, Logilink India, Mr. Cherian Kuruvila, Managing Partner, CNC Transcend and the moderator, Prof. D Subramaniam, Faculty, SIBM, Bengaluru. The post event session concentrated on the financial aspects of the market. “Going the extra Mile”, the theme of the session, resonated with the speech delivered by Mr. Siddharto Banerjee,MD,CEO, Markit Financial Services India. His insights into the economic measures of the newgovernment and their implications, helped students discern the complex financial situations that our nation faces at present. It was followed by an invigorating panel discussion where the students were graced by the presence of eminent personalities from the industry like Mr. Deepankar Bose,GM, SBI, Mr.Arun Kumar,Executive Director, Credit Rating Nomura Capital India, Mr. Ramana Kumar, Head, ALM ING Vyasa Bank, Mr. Chirag Shah, Director(Supply Chain), Unilever, and Ms. Deena Jacob, Finance Controller Taxi for Sure. 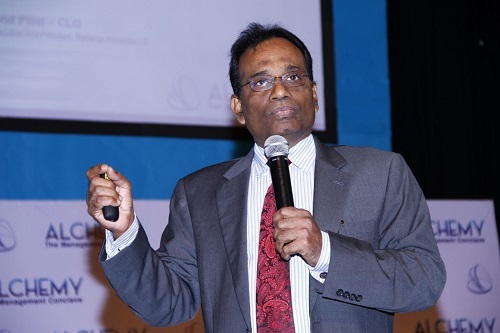 The panel was moderated by Prof. Ravi Kumar, Placement Head, SIBM Bengaluru. Art is the expression of the heart, a creation, pure and untainted by the brutalities of reality. Art is a gateway that leads us to a safe haven which may not heal but it is a comfort and balm. Another event that happened simultaneously with Alchemy was Satkala-The Art Exhibition. The theme of Satkala 2014 was “Through the looking glass”. 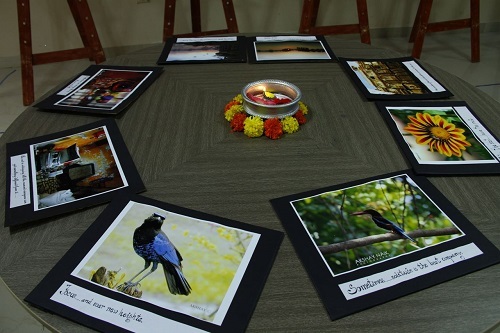 It was a corporate art exhibition showcasing talents like paintings, sculpture, photography, origami and many more. Satkala experienced a lot of entries in these categories and the winners were awarded with prizes, gifts and goodies. Mr. VasanthRajan, an HR student says “I had a great time at Satkala. It was a very interesting experience to be a part of this event. It is a great platform for us young and budding artists”.